1st floor screened in porch off the dining area. 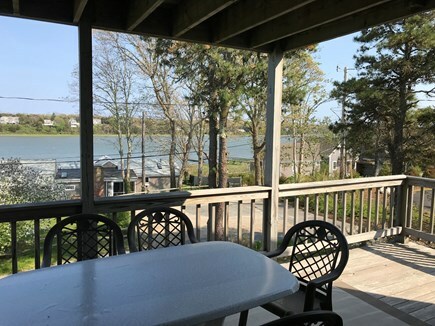 This 2200 sq ft Contemporary Colonial home offers access to Town Cove and a private dock. 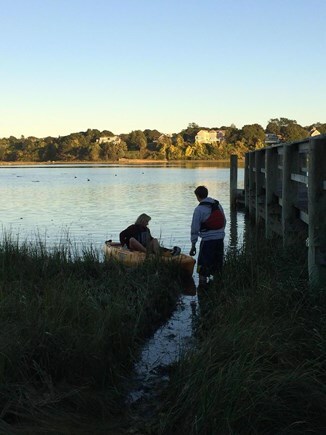 Beautiful kayaking, paddle boarding or whatever are all just steps away on Eastham's Town Cove. 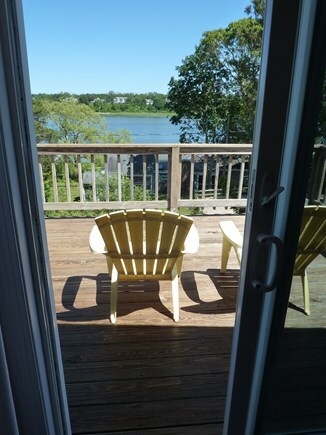 There are 3 Decks off the back of the home, offering beautiful views of Town Cove, and one of the decks is screened in. There is a dock on Town Cove for your use. 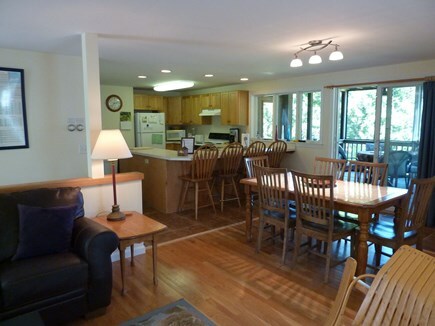 The house offers 2 livings rooms, 3 bedrooms plus a 3rd floor loft area with a foldout couch. 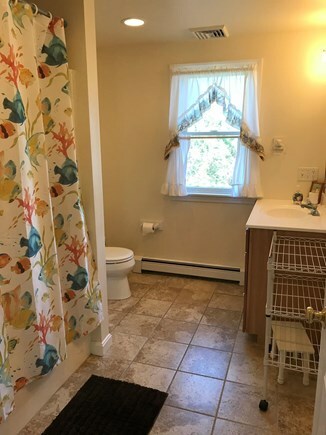 Central Air, 2 full bathrooms & outdoor shower, gas fireplace, washer/dryer, dishwasher, gas grill, 3 color cable TV's, wireless Comcast INTERNET ACCESS and more. The home is meticulously maintained. Owners live next door. Off season rates and dates are very flexible. Additional pricing info: Off season rates are based on 4 people a charge of $30/pp/per night will be added for more. Call, State and local taxes of 12.45% will apply. 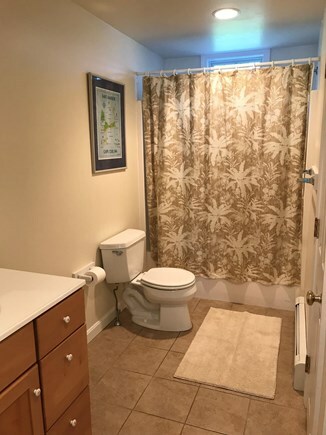 no ramp but there is a first floor bedroom and bathroom. My family has stayed here several times and will just keep coming back. It's a beautiful house with gorgeous views. There's a nice yard if you have children. The kitchen is spacious and well equipped. There is a washer/dryer in the basement which is wonderful to have on site. 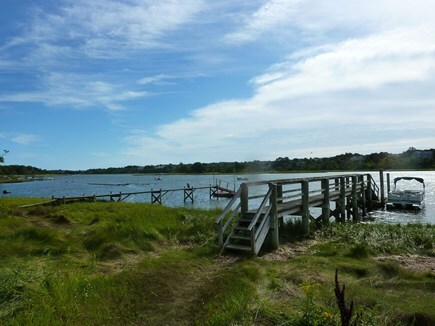 It's great to have the dock and access to the water. You can enjoy fishing and relaxing. My husband launches his kayak from the dock. I would highly recommend this property for your vacation. Stayed a week and we had a great vacation! Spacious, clean and comfortable. We didn't have a kayak but did enjoy the dock! My son and his friends caught green crabs and a horseshoe crabs off of it plus there were a couple of huge blue claw crabs lurking around. We didn't get any blue claw crabs but it only added to the excitement. The house is well stocked with puzzles and games too in case it rains or if you are interested in staying out of the sun for the afternoon. We definitely will be back! We have been staying at this house for many years! We absolutely love it and look forward to our week in August every year. 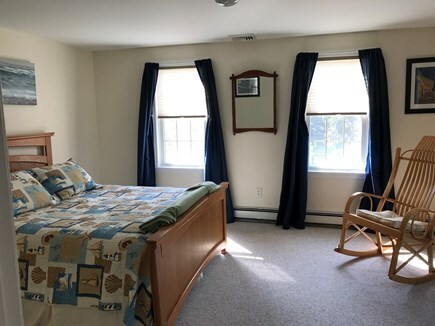 We are a group of 6 - 2 grandparents and our family of 4 (2 adults and 2 teenage boys) Our extended family really enjoys the layout of this beautifully appointed home. My parents use the bedroom on the main floor and we take the upstairs bedrooms. The two living areas give options for hanging out and just enjoying quality family time. 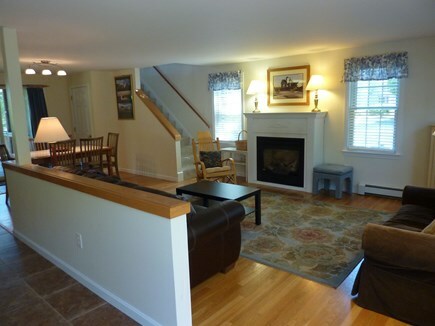 Anything you can think of or need is included in this home, Leslie and Pete have thought of everything. 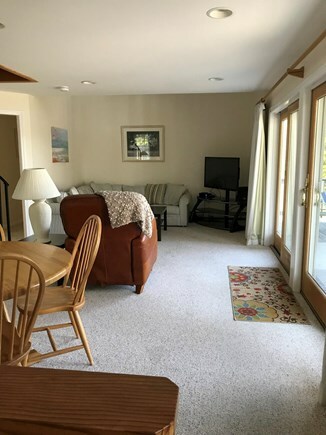 My family loves the beach and my parents love to just tour the Cape, the house is located in a perfect spot to be able to enjoy all the Cape has to offer. We find that going out to dinner is not as exciting as when the kids were young and we now love coming back to the house in the evening and making a big family dinner using the grill for steaks or bringing in some amazing local seafood to relax and enjoy. My kids fish off the dock every year and usually catch some crabs and think its just the best thing ever. 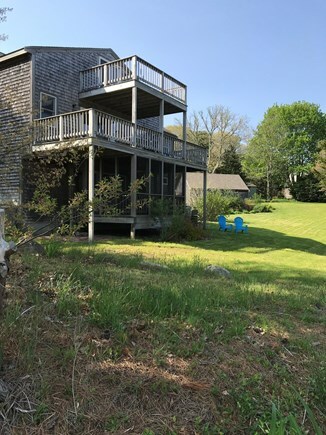 The 3 decks in this home are spectacular, the main floor is an enclosed deck, my parents love to sit there and have their morning coffee and read, it is perfect, no bugs and not as hot as the higher levels. 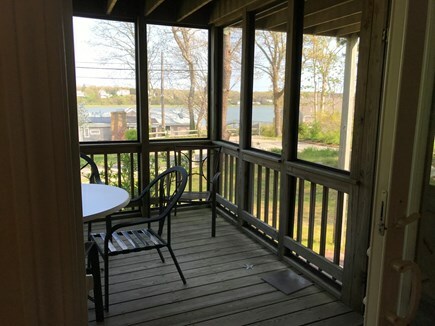 The deck on the very top is a favorite of our boys, they head up the spiral staircase to the loft and then relax on the deck with some music and watch the boats go by... the middle level is great for relaxing with a book or having a meal while getting a little sun. 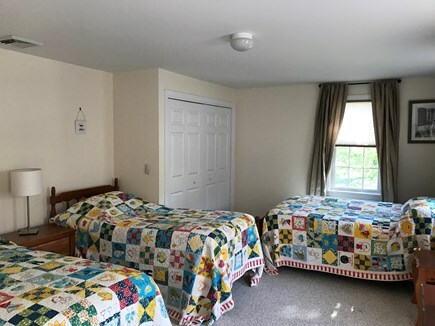 I’ve had the pleasure of staying here for years and I honestly can’t imagine our yearly Cape Cod vacation without it. 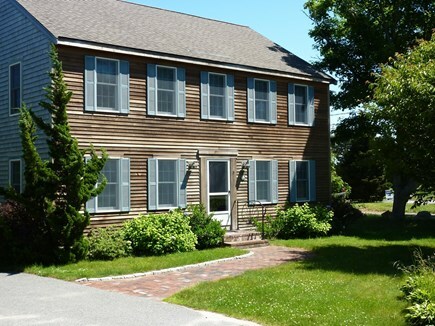 Conveniently located in South Eastham, this home is central to everything you’d want to do while on Cape. A few miles away from the beach, grocery stores, a wide range of restaurants and even a bowling alley (try the BBQ! ), you’ll never have a shortage of activities rain or shine. 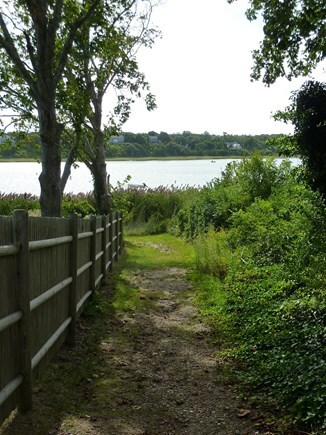 We have lived in Eastham since 1985. We built this rental home next to our home in the year 2000. 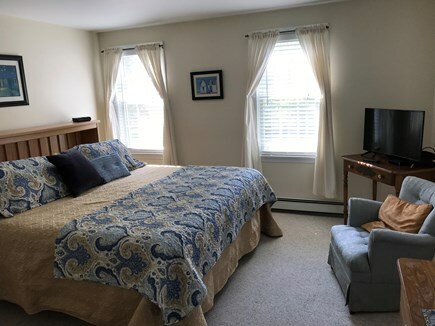 Most of our summer renters are repeats - some being with us since the beginning but periodically weeks become available.